Where to Stay: Nomad or Settler? Alaska is a huge state, and it takes a bit of time and effort to get there. Fortunately there’s plenty to see and do once you get there. The question of how to best take advantage of everything Alaska has to offer is an issue of personal preference. One choice is to be a nomad, spending one or two days in a given place. The Cirrus enables us to fly virtually anywhere in the state in just a few hours, so the nomadic trip--visiting five or eight sites over a one or two week period--is certainly a very viable option. Another choice is to be a settler, spending a week or two (or more) based in a specific place, with periodic day or short trips to other areas of the state. 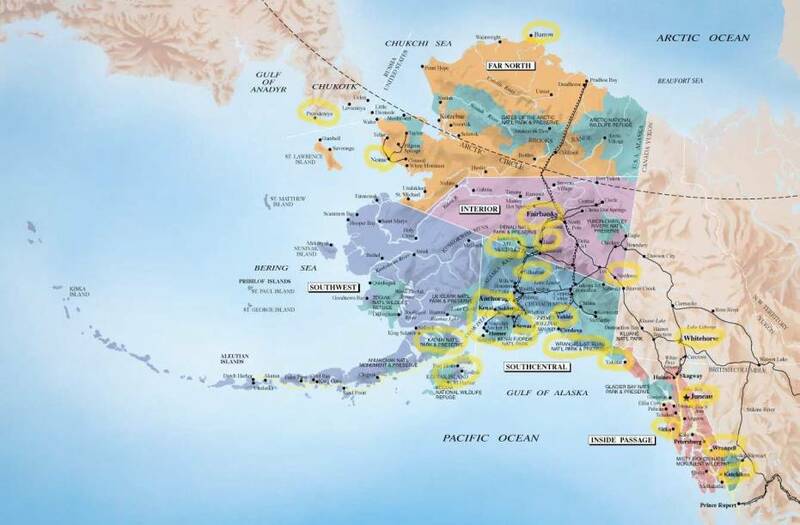 This Alaska Flying Guide is designed to enable Cirrus pilots (along with their families and friends) to plan the vacation trip that best suits their inclinations. Information is given about a wide variety of interesting places and activities, as well as towns where a family or group can settle in and just enjoy the unique beauty and pace of life that Alaska offers. Nearly all of the towns listed below can serve as the base for a 4-7 day visit, with plenty of hiking, fishing, rafting, flightseeing and glacier watching activities nearby. Or one can plan to spend only one or two nights at a variety of these towns. The choice is yours and its virtually impossible to make a mistake because of the variety of activities and sights that are available in any given locale. Unless otherwise noted, quoted portions in this section and the associated links, as well as many of the details below, are excerpted from the copyrighted Alaska Activities Guide, published by Alaska Channel, PO Box 103455, Anchorage, AK 99510. This map has yellow highlights drawn around the various places of interest noted in this section.